"I have always thought there was such beauty about a room even though there weren't any people in it, perhaps precisely when there weren't any." "Personally I am fond of the old; of old houses, of old furniture, of that quite special mood that these things possess." "What makes me choose a motif are ... the lines, what I like to call the architectonic attitude in the picture. And then the light, naturally. Naturally it also has a great deal to say, but what means practically the most for me is the lines." Vilhelm Hammershøi was born on the 15th of May, 1864 in Copenhagen, Denmark. The son of a well-off merchant, he was brought up with his sister and two brothers in a large house in the Old Quarter of Copenhagen, a city where he would remain for the rest of his life. Hammershøi showed artistic talent from an early age and was encouraged by his mother to begin training at the age of eight; his older brother Svend was also a painter. Vilhelm trained at the Royal Danish Academy of Fine Art between 1879 and 1884, taking lessons from the painter Niels Christian Kierkegaard, cousin of the famous philosopher Soren Kierkegaard. Hammershøi also worked with the Realist portraitist Frederik Vermehren, and thus was exposed from a young age to the great traditions of Danish painting. Vermehren himself had a place in that tradition, having been associated with the so-called Danish Golden Age of the early nineteenth century, when artists such as Christian Købke and Wilhelm Bendz depicted Romantic landscapes and interior spaces suffused with bright, clear light. Hammershøi, whose own paintings are filled with a more subdued light, went on to study at the liberal Free School of Study for Artists, taking lessons from P.S. 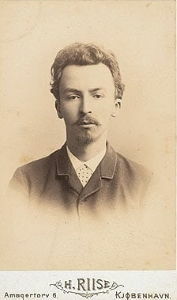 Krøyer between 1883 and 1885. Though Krøyer worked in a form of lyrical Naturalism - he was associated with the plein air painters of the Skagen group - he was keen to allow Hammershøi's talent to develop along its own lines. In a letter to a friend he remarked: "I have a student who paints quite strangely. I don't understand him, think that he will become prominent, will try not to influence him." In Spring 1885 Hammershøi submitted a portrait of his sister Anna to Copenhagen's annual Charlottenborg Exhibition. The work was controversial, as it rejected many of the tenets of Naturalism prevalent across Europe at the time, offering a more sombre, psychologically complex tone than had been expressed in recent Danish painting. Hammershøi was labelled by some as a 'neurasthenic', his works deemed to express the symptoms of nervous illness. Seemingly unperturbed, in 1887 he travelled to Holland, familiarising himself with the work of the Dutch Golden Age and, most significantly, with Johannes Vermeer, whose work would remain a crucial influence throughout the rest of his career. Hammershøi submitted two more works, Young Girl Sewing and Bedroom, to the Charlottenborg Exhibition in 1891, but both were rejected. In response he, along with a number of other young artists, established Den Frie Udstilling, an independent salon along the lines of the Salon des Refusés in Paris which served as a forum for the expression of new and challenging artistic trends. 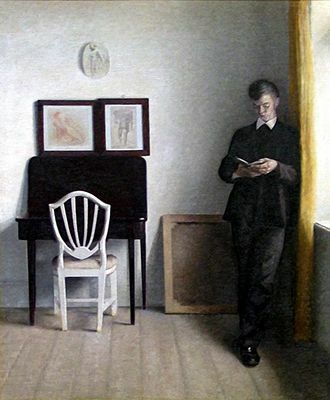 Portrait of Vilhelm Hammershøi aged 25 (1889). 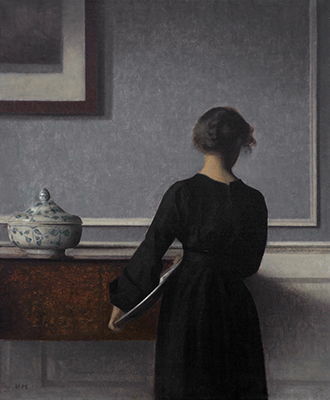 In 1891 Hammershøi married Ida Ilsted, who would become a much-used model in his work, particularly in the interiors for which he is now remembered. 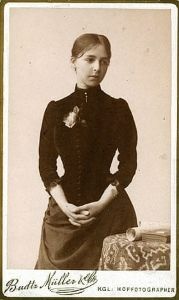 Ida also modelled for paintings by her brother Peter Ilsted who, like Hammershøi and the artist Carl Holsøe, was one of the key members of the so-called Copenhagen Interior School, known for their atmospheric domestic scenes. After their marriage, Hammershøi and Ilsted spent six months in Paris, commencing a period of relatively frequent travel. Hammershøi made several other trips across Europe, including to Germany, Belgium and Italy. He also visited London on five separate occasions from 1897 onwards, at one point attempting unsuccessfully to visit his idol James Abbott McNeill Whistler. In 1905-06, he created two works depicting the façade of the British Museum, having turned more attention during the first few years of the twentieth century to exterior urban architecture. 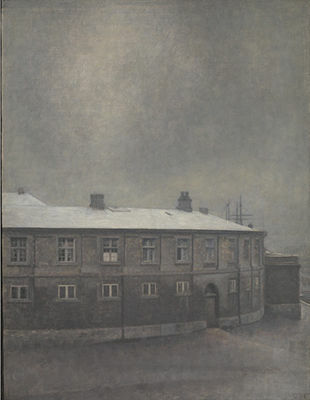 It is possible to speculate on the influence on this work of various artists whose work Hammershøi might have encountered first-hand during his travels, including the Camden Town Group. 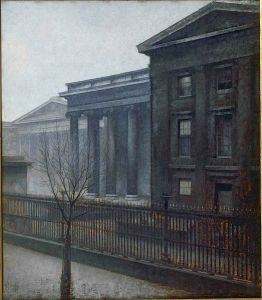 Hammershøi's From the British Museum, Winter, composed in 1906 during one of his many visits to London. However, the details of Hammershøi's biography remain as scant as the interiors of his rooms. What is known is that much of his and Ida's life together was spent in two apartments a few doors away from each other in the Christianshavn district of Copenhagen: first Strandgade 30 between 1899 and 1909, then Strandgade 25 between 1913 and 1916. These apartments are the primary settings for Hammershøi's most famous paintings, and the muted color-scheme and hue of the works directly reflects the couple's designs for the apartments, which were painted in whites and pale greys. The layout of objects in these paintings reflects - and helped to contribute to - a new decorative style in Denmark at the time, distinctly more minimalist than the opulent fashions of the fin-de-siècle period in other countries. 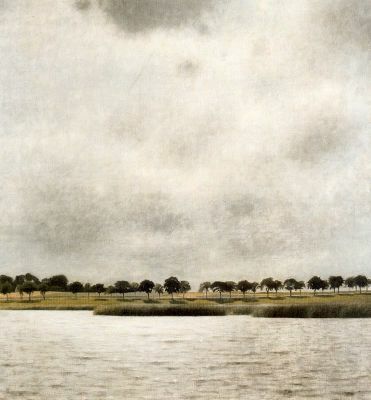 By all accounts, Hammershøi was a quiet man, without many friends. However, he was said to have had many creative admirers, including the poet Rainer Maria Rilke, who noted that "[h]is work is long and slow and at whatever moment [one] comes to grips with it, one will have ample occasion to speak of what is significant and essential in art." Hammershøi was supported and mentored by the art collector Alfred Bramsen, who bought his first painting by the artist in 1898, and would publish a biography of him two years after his death. 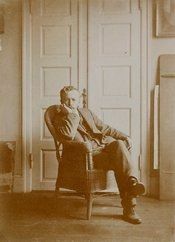 Vilhelm Hammershøi in his apartment at Bredgade 25 (c. 1912). Although it is thought that Hammershøi kept diaries and personal letters throughout his life, many of these were burnt, so we do not have a huge store to draw from when speculating on his personal life. In a rare interview given in 1907, he spoke of the interest that interior spaces held for him: "I have always felt that such rooms possess great beauty even if there are no people in it; or perhaps precisely when there are none." 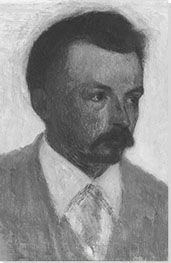 After several months in hospital, Hammershøi died of throat cancer in 1916. He was only 51 years old. The last painting he completed showed his wife sewing in the apartment they shared together. A memorial exhibition was held for him at the Copenhagen Kunstforeningen later that year. Though Hammershøi is now well-known as "the painter of tranquil rooms", it was only after a breakthrough exhibition in 1982 that he became celebrated outside his native Scandinavia. That show, Northern Light: Realism and Symbolism in Scandinavian Painting, 1880-1910, was curated by the art historian and critic Kirk Varnedoe, and held at the Brooklyn Museum in New York. It introduced the world to a range of little-known works, picking out an alternative narrative of European modern art to the familiar story of Impressionism and its offshoots. Hammershøi's informal arrangements of people and objects, full of mystery and melancholy, formed a central pillar of the show, throwing his work into a perhaps unlikely spotlight. Hammershøi's influence can be felt across a significant roster of modern and contemporary painters' work. The pregnant atmospherics of his interiors might seem to predict the more exaggerated emotive genre painting of Northern European Expressionism, while, although his work is not easily related to the most iconoclastic strands in early-twentieth-century avant-garde art, it can be compared to the allusive object-based painting of Italian Metaphysical artists such as Giorgio Morandi. 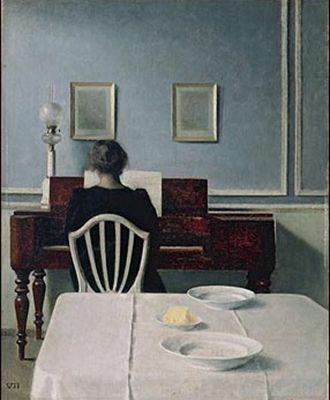 Hammershøi's influence can also be sensed in American Realist and Regionalist painting, most obviously the oeuvre of Edward Hopper, and later the work of Andrew Wyeth. In Hopper's lonely interiors, and in the arrangement of his figures - often pictured alone, or from a distance so that the face is obscured - we can catch an echo of Hammershøi's lithe portraiture. Hammershøi's aesthetic legacy is not limited to painting, moreover, but can also be crucially linked to film. 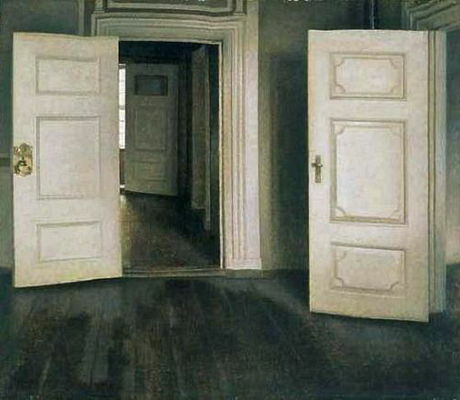 In Ingmar Bergman's Cries and Whispers (1972), several shots of corridors and rooms replicate the unusual perspectives of Hammershøi's work. 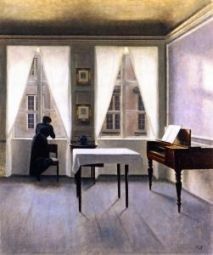 More recently, the 2016 film The Danish Girl used Hammershøi's paintings as inspiration for the early part of the film set in Copenhagen. The set-designer for the film noted that the team wanted to recreate the artist's cool color-palette and minimalist aesthetic in order to communicate the new interior design principals popular at that time. This portrait of Hammershøi's younger sister Anna was created when the artist was just 21 years old. 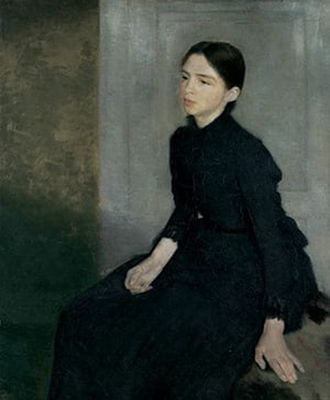 It might seem a somewhat unremarkable work, depicting a young woman with a faintly distracted expression wearing a black dress and set against a neutral background. But in its very informality and lack of ceremonial significance - its truth to life - it reflected some of the paradigms of Naturalist and Realist portraiture popular in Europe and Russia at the time. At the same time, it also introduces the subtle allusiveness that would set Hammershøi's work apart from those genres, shifting the composition into a space of dreamlike intensity. In compositional terms, the informal arrangement of the interior, and the capturing of the sitter in an apparently momentary posture, brings to mind the newly incidental quality that photography had suggested to painting - the work seems almost like a snapshot of a passing moment. Her hands are oddly arranged: one sits curled on her lap, the other placed lightly on the surface, on which she perches at an odd-angle away. Perhaps partly because of this quality of ephemerality, the young woman seems somewhat unknowable: her expression is inscrutable, as she looks off into the distance. The painting caught people's attention at the time precisely because of its lack of detail: it did not give away any details of the sitter's class, occupation, or character. All the drama and intrigue of the painting seems to lie in questioning the internal thought process rather than reading the explicit cues of composition and style. In opening out the meaning of the work to the viewer, it established Hammershøi as a subtly avant-garde painter, who exposed news ways of suggesting meaning through representative art. First published on 26 Dec 2018. Updated and modified regularly.